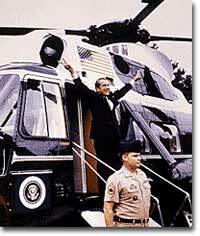 Nixon had a strong “us v. them” mentality. On June 17, 1972, five men were arrested after breaking into the headquarters of the Democratic National Committee located in the Watergate Hotel in Washington, D.C. The burglars were not ordinary thieves. They carried wiretaps to install on telephones. They carried cameras to photograph documents. 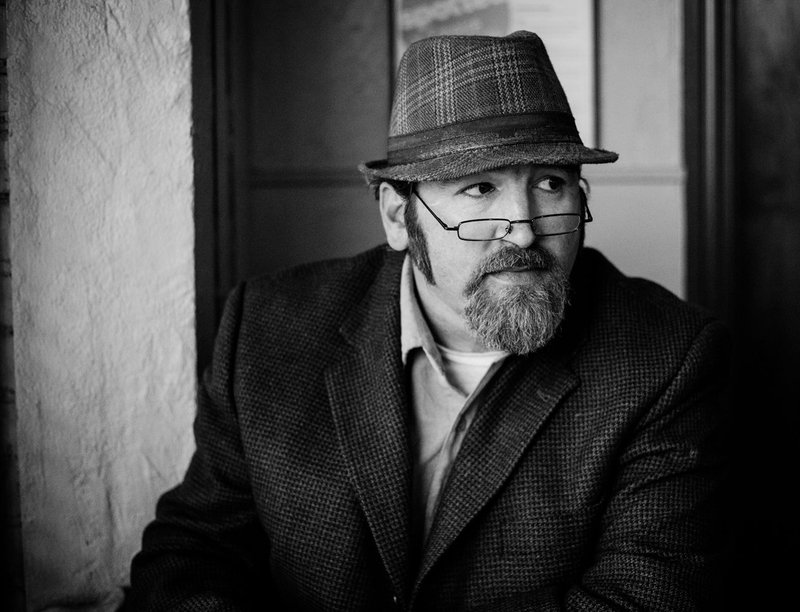 Four of the five criminals were anti-Castro Cubans who had been previously hired by the CIA. The fifth was James McCord, the security adviser for Nixon’s campaign staff known as the Committee to Reelect the President, or CREEP. Although the incident failed to make the front pages of the major newspapers, it would soon become the most notorious political scandal in American history. The Watergate office complex — site of the infamous 1972 break-in that led to the first Presidential resignation in American history– is still in use in Washington, D.C. In the heated climate of the late 1960s and early 1970s, President Nixon believed strongly that a war was being fought between “us” and “them.” To Nixon, “us” meant the conservative, middle- and working-class, church-going Americans, who believed the United States was in danger of crumbling. “Them” meant the young, defiant, free love, antiwar, liberal counterculture figures who sought to transform American values. 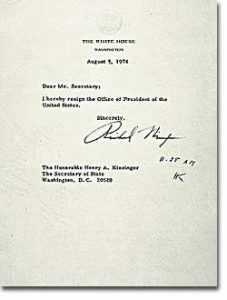 President Nixon’s letter of resignation (above) is addressed to the Secretary of State — who at the time was Henry Kissinger — in keeping with a law passed by Congress in 1792. When Kissinger initialed the document at 11:35 a.m., Nixon’s resignation became official. In 1971, a White House group known as the “Plumbers” was established to eliminate administration leaks to the press. Their first target was Daniel Ellsberg, who had worked on the Pentagon Papers, a highly critical study of America’s Vietnam policy. Ellsberg leaked the Pentagon Papers— intended to be used internally by the government — to the New York Times. The Plumbers vandalized the office of Ellsberg’s psychiatrist, hoping to find discrediting information on Ellsberg to release to the public. Later that year, Attorney General John Mitchell resigned to head CREEP. The campaign raised millions of dollars in illegal contributions and laundered several hundred thousand for plumbing activities. A White House adviser named G. Gordon Liddy suggested that the Democratic headquarters be bugged and that other funds should be used to bribe, threaten, or smear Nixon’s opponents. After the arrest of the burglars, Nixon suggested the payments of hush money to avoid a connection between Watergate and the White House. He suggested that the FBI cease any investigation of the break-in. He recommended that staffers perjure themselves if subpoenaed in court. 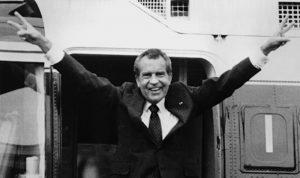 Richard Nixon delivers his trademark “V” sign with both arms as he prepares to leave the White House for the last time on August 9, 1974. The Watergate cover-up was initially successful. Despite a headline story in The Washington Post by Bob Woodward and Carl Bernstein, suggesting White House involvement, Nixon went on to win 49 of 50 states in the November 1972 Presidential election against George McGovern. Complicitous in the cover-up, many high-level White House officials resigned including Nixon’s Chief of Staff, Bob Haldeman, and his Adviser on Domestic Affairs, John Ehrlichman. In an unrelated case, Vice-President Spiro Agnew resigned facing charges of bribery and tax evasion. Nixon’s own personal counsel, John Dean, agreed to cooperate with the Senate and testified about Nixon’s involvement in the cover-up. In a televised speech, Nixon assured told the American public “I am not a crook.” It seemed like a matter of Nixon’s word against Dean’s until a low-level aide told the committee that Nixon had been in the practice of taping every conversation held in the Oval Office. During his years in office, Nixon had brought a controversial end to the Vietnam War, opened communication with Red China, watched NASA put astronauts on the moon, and presided over a healing period in American history in the early 1970s. Despite these many accomplishments, Watergate’s shadow occludes Nixon’s legacy.